Without further adue-take a snapshot of this photo, because youll def want to keep it around and handy for like, ever. I thought I’d share this from one me my favorites-What Not to Wear! (Clint is def my favorite). 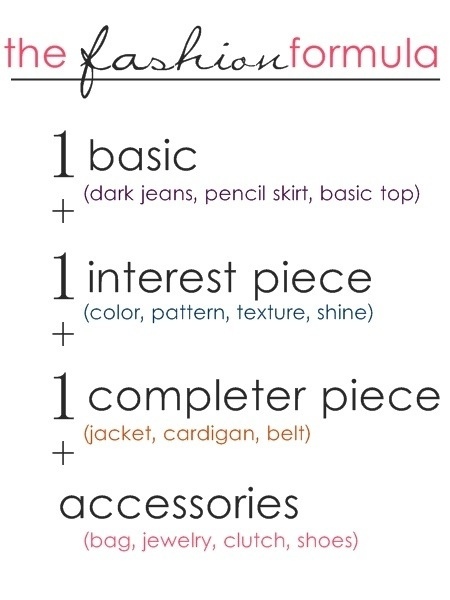 But this fashion formula is SOOO true!! For fall, this is my formula- 1 basic can be a chunky sweater, or for me-my dark grey spikes sweater. The interesting piece is my super rad leather leggings, the completed piece would have to be my black scarf, and I always like on accessories. (Outfit pic to follow later). But go by this formula-you’re like is now complete. You’re welcome!